Credit: NASA/GSFCAn instrument that will measure the composition of Mars’ upper atmosphere has been integrated into NASA’s Mars Atmosphere and Volatile EvolutioN (MAVEN) spacecraft. MAVEN has a scheduled launch date of Nov. 18. 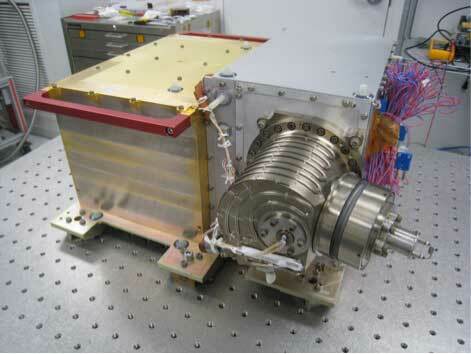 The Neutral Gas and Ion Mass Spectrometer (NGIMS) instrument, shown here at NASA’s Goddard Space Flight Center in Greenbelt, Md., before its integration onto NASA’s Mars Atmosphere and Volatile EvolutioN (MAVEN) spacecraft. The Neutral Gas and Ion Mass Spectrometer instrument, shown here at NASA’s Goddard Space Flight Center in Greenbelt, Md.Engineers and scientists at NASA’s Goddard Space Flight Center in Greenbelt, Md., in collaboration with partners at the University of Michigan, Ann Arbor; Battel Engineering, Scottsdale, Ariz., and AMU Engineering, Miami, Fla., built the Neutral Gas and Ion Mass Spectrometer (NGIMS) instrument.